I love hearing people talk about Sgt. Pepper, I love the mystery that to this day, surrounds not only the music but the album artwork. I really love references to ‘Sgt. Pepper’ in other artist’s songs. I get shivers when I hear the songs “Sgt. 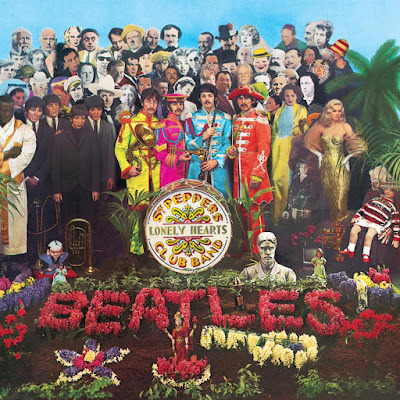 Pepper’s Lonely Hearts Club Band”, the “Reprise” and “A Day In The Life.” And prior to the album being released, I insisted that everyone stop dead, when the prerelease radio version was played. I was one of the first in line to buy the record, I carried the record around with me as a badge of the times, I knew all of the lyrics … and now 50 years later, I must say that I am not at all fond of the music, nor do I think I ever was; other then the three songs I mentioned. I can not recall the last time my hand reached for the disc. This in no way means that I don’t think the release had a momentous effect on the music, art, and culture of the times; indeed it did, but I think I’m more in love with the idea, the time, and what this album represented than I am with the music. Prior to the release of Sgt. Pepper there was a double sided single from the boys, “Strawberry Fields Forever”, and “Penny Lane.” My single of this release has a picture sleeve, with “Strawberry Fields Forever” given one side of the sleeve, and “Penny Lane” the other side, in other words, there was no A or B side, and both of these songs were, in my opinion, some of the strongest pop songs ever to see the light of day. But they did not reflect what was to come on the Sgt. Pepper album. Today, I see them as more representational of Magical Mystery Tour, but in 1967 there was not much for me to recognize on Sgt. Pepper. Yes, it was a stunningly beautiful release, full of introspective thought and ideas, amazingly visionary musical heights, and a whole new way of not only perceiving music, but a new way of producing it as well. But on the whole I found it to be perplexingly quiet, with songs more reminiscent of Paul’s youth, then of the times I was living through; and I was not at all interested in going back in time, I wanted to ride the wave of the 60’s to its highest water mark into the future. There was plenty within the grooves that set my head reeling with thought and intellectual curiosity, but there was nothing to set my summer nights on fire, nothing to set my feet to dancing. And once the novelty of the concept passes, what were we left with … we were left with the idea that this album would take the place of the Beatles and go on tour for them. Listen, all groups should develop and change, I’ll be the last person on earth to ask for another album just like the last one … but Sgt. Pepper offered me nothing that I recognized either within my self or the Beatles. I fully recognize that the Beatles were breaking new ground, discovering new concepts and spacial orientations, but Sgt. Pepper just seemed like a hole in the wall, relating to nothing that had come before or anything that would follow. So why do so many people feel this is the best album of all time … I have no idea. Could I live without this album in my life … not a chance. Even Paul and Ringo have attested that this was not their best effort, but the Beatles were the golden boys, they could do no wrong. I feel that people [the public] are reluctant to say they don’t like something when they have put so much effort into it, into trying to discern the message, into fitting the album into their lives. And after hearing all of the critics rave, why would anyone want to admit that they don’t get it … they might feel that not ‘getting it’ would make them seem out of touch or not hip [I mean really, how many people cite ‘Ulysses’ by James Joyce as a seminal book, and how many have actually read it] … and as teenagers, who wants to be perceived as not hip. Once that step is taken, people tend to carry this thinking on forever, thus the record is given way too much credit, especially over releases like Revolver, Magical Mystery Tour or the host of singles [that could have made an exceptional album], which actually had a palatable flavor. I had a Sgt. Pepper patch on my Army [the M51 Field Jacket] Jacket, and I got myself some nice fines for wearing it. And you know, each time I was made to remove that patch, I’d sew it right back on. So long live Sgt. Pepper, the lonely album that is seldom played. Sgt. Pepper’s Lonely Heart Club Band is rife with “Paul is dead” clues. It was Paul’s idea that the Beatles immerse themselves in another identity for this 1967 release. The name Sgt. Pepper’s Lonely Heart Club Band was a play on verbose hippy era band names, such as ‘Dr. West’s Medicine Show and Junk Band.’ The cover photo, then, shows the Beatles assuming this new identity and laying to rest their earlier image as the Fab Four. People looking for clues of Paul’s death, however, interpreted the cover of Sgt. Pepper as representing Paul’s burial and the end of the Beatles as we had known them. The wax images of the younger Beatles look mournfully on the gravesite because the Beatles were no longer the same band. Looking at the older, psychedelic Beatles, you’ll notice a couple of odd things. While the rest of the Beatles are standing at an angle, Paul is facing the camera as though he were being supported by his bandmates standing at his sides. The Beatles are all holding band instruments, but Paul’s is black (he’s holding a cor anglaise) while the rest are holding brass instruments. A hand is over Paul’s head, as though he were being blessed by a priest before being interred. Across the gravesite is a bass guitar oriented the way Paul, who was left-handed, would play it. The strings of the instrument are made of sticks but there are only three sticks rather than four, just as there would only be three Beatles without Paul. With a little imagination you can see that the yellow hyacinths spell out “PAUL?” or, looked at another way, the flowers form the letter “P”. Perhaps the most imaginative interpretation of an image on the cover of Sgt. Pepper is that if you hold a mirror across the middle of the words “LONELY HEARTS” written across the center of the bass drum, you will see “IONEIX HE<>DIE”. When arranged as “I ONE IX HE <> DIE”, this image suggests the date (11-9, or November 9, 1966) that Paul died, as the diamond between the words “HE” and “DIE” points directly at Paul. One problem with this interpretation is that the British write dates as day-month-year rather than the American month-day-year, which would make this date September 11th rather than November 9th. You could read this, then, as “1 ONE 1 X”, meaning that one of the four is gone, and then the “HE DIE” points to Paul as the missing Beatle. The doll at the right side of the picture–the cloth figure of Shirley Temple–wears a sweater that reads “WELCOME THE ROLLING STONES”. Perhaps the Rolling Stones were involved in the conspiracy, as Joel Glazier asserted. This message also suggests that without the Beatles the Rolling Stones would have been the undisputed leading rock and roll band. A model of an Aston-Martin, the type of car that Paul was supposedly driving at the time of his fatal accident, is leaned against the doll’s leg. The interior of the car is red, symbolizing Paul’s bloody accident. Also, the cloth grandmother figure, on whose lap the Shirley Temple doll is resting, is wearing a blood stained driving glove. The Japanese stone figure at the feet of the wax images of the younger Beatles has line on its head, representing the head wounds that Paul sustained in his fatal accident. The four-armed Indian doll at the front of the picture is Shiva, symbol of both destruction and creation. Two of the doll’s arms are raised, one pointing at the wax image of the younger Paul and the other pointing at Paul himself. The television set on the ground to the right of the Beatles is turned off, suggesting that the news of the tragedy had been suppressed. The album cover of Sgt. Pepper’s Lonely Hearts Club Band was innovative in several ways. It was one of the first to feature a gatefold sleeve and it was also the first album to have the song lyrics printed on the cover. On the inside photo, Paul is wearing a patch with the letters “O.P.D.”, interpreted as “Officially Pronounced Dead”. According to John Neary, this phrase is the equivalent of “Dead On Arrival” in British police jargon. In the Life magazine article Paul stated, “It is all bloody stupid. I picked up the O.P.D. badge in Canada. It was a police badge. Perhaps it means Ontario Police Department or something. This explanation didn’t help to clarify anything, however, because there is no such thing is the Ontario Police Department. The badge Paul was wearing actually reads “O.P.P.”, which stands for the Ontario Provincial Police. The angle of the photograph makes the final “P” look like a “D”. On the original LP the song lyrics are printed on the back cover over a picture of the Beatles. Unlike the rest of the Beatles, Paul has his back turned to the camera, the three black buttons on the back of his coat representing the mourning of the other Beatles. Though John, Paul and George were all about the same height, Paul appears taller than the other Beatles, suggesting that he is ascending. Next to Paul’s head are the words “WITHOUT YOU” from the song title “Within You Without You”. Also, George appears to be pointing at the words “Wednesday morning at five o’clock as the day begins”, which was supposed to have been the time of Paul’s fatal accident. Note: the picture of the Beatles that originally appeared on the back cover of the LP is shown on pages 12 and 13 of the CD booklet, but the lyrics are not presented in the same way as they were on the LP. George positioned his hand in this way not to point to the printed lyrics, but to make the letter “L”, the first letter in the word “LOVE”, as the Beatles appear to be spelling out the word “LOVE” with their hands. In addition to George pointing his fingers in the shape of an “L”, John’s hands are arranged in a “V” shape, and Ringo’s clasped hands form an “E”. The “O” is missing as Paul’s hands are not visible. Magical Mystery Tour was packaged as double 7” EP in the UK with a 24-page booklet. EPs have never sold well in the United States, so Capitol packaged the songs from the film with non-LP singles for a full LP. The 24-page booklet was resized accordingly, making the “Paul is dead” clues larger and more numerous in the American release. Unfortunately, many of these images were not included in the CD release of Magical Mystery Tour. On page 3 of the booklet, Paul is shown sitting behind a desk with a nameplate that reads “I Was”. The nameplate could also be read as “I You Was” or “I Was You”, perhaps suggesting that Paul had disappeared and been replaced by a double. Also, the British flags behind Paul are crossed as they would be in a military funeral. On page 6 of the booklet, John is manning a ticket booth with a sign that reads “The best way to go is by M&D Co.”. According to the “Paul is dead” rumor, M&D Co. was a funeral parlor, but such a place never existed. Note that in the picture, the departure time is given but no return time is listed. On page 9, “Fool on the Hill” is shown next to a cartoon image of Paul. The final “L” in the title extends over Paul’s head, as though his head were split open. This picture suggests the head injury that Paul sustained in his fatal accident. In the group photos on page 10 and pages 11 and 12, Paul is shown without shoes. He is wearing socks, though, which makes this somewhat less compelling as an image of death than the cover of Abbey Road. Also, on Ringo’s bass drum between “Love” and “The Beatles” and the numeral “3”—that is, “Love the 3 Beatles”. Also, blood appears to be dripping from Paul’s shoes, which are lying next to the bass drum. Fred LaBour asserts that, “empty shoes… were a Grecian symbol of death”. And on the final page, a hand is over Paul’s head. This instance of a hand over Paul’s head isn’t as effective as a clue to Paul’s death as the Sgt. Pepper cover photo, though. Several people have their hands raised and many are positioned over other people’s heads in this picture. For example, the man standing second to Paul’s left has a hand above his head as well. A number of conspiracy theorists have pointed to a strange image appears in the booklet of Magical Mystery Tour. On the left is the image as it appears in the booklet, but on the right is the image rotated ninety degree clockwise and blurred slightly. With a little imagination you can see a skull in this picture. It occupies the left side of the picture, with the beret of the person seated at the table forming the eye and the hair of the woman seated next to him the mouth. Once you’ve accepted that this is a skull, it’s easy to see the damage to the top of the head. This grisly image suggests the damage to Paul’s head as a result of his car crash. The puzzling thing about this picture is that, unlike the other images in the booklet, this one does not appear in the movie. Then there’s the whole business about the word “Beatles” on the cover of Magical Mystery Tour revealing a secret phone number. As Rolling Stone pointed out, it’s not exactly clear what that phone number is supposed to be. It could be “231-7438, 834-7135, 536-0195, 510-6643, 546-3663, 624-7125, no telling what city, maybe London”. If you turn the album cover upside down and hold it in front of a mirror you can see the numbers 8341735, which is a stretch because the threes, the seven and the five (could it be a two?) are backward. If you simply hold the album cover upside-down, the numbers could be 5371438. And what about the area code? ANYway, supposedly when a person dialed this number they would receive information about Paul’s death, or the person would be able to take a trip to “Magical Beatle Mystery Island”—or perhaps even speak to Paul in the hereafter. Stories abounded about the strange responses that callers received from the party on the other end of the line. According to Philip Norman in Shout! The Beatles in Their Generation, this phone number actually belonged to a journalist for The Guardian who was nearly driven crazy by the numerous phone calls from people hoping to connect with the late Paul McCartney. “I Am the Walrus”, “don’t you think the joker laughs at you?”. To look for clues in “I Am the Walrus” is rather ironic, since, according to Pete Shotton, John intended to write a song with nonsensical imagery to confound those who looked for significance in every Beatle lyric. After recalling a grotesque song they used to sing as children, John strung together the most ludicrous imagery he could think of. Shotton recalls that after writing the song, “He turned to me, smiling. “Let the fuckers work that one out, Pete”. Still, this hasn’t stopped people from looking for “Paul is dead” clues in the song. According to the “Paul is dead” rumor, Paul left the recording studio in anger on a “stupid bloody Tuesday” after squabbling with his bandmates. The refrain “I’m crying” is John expressing his grief over Paul’s death. The references to “pretty little policement” and “waiting for the van to come” supposedly refer to the police who were present at the site of Paul’s fatal accident. 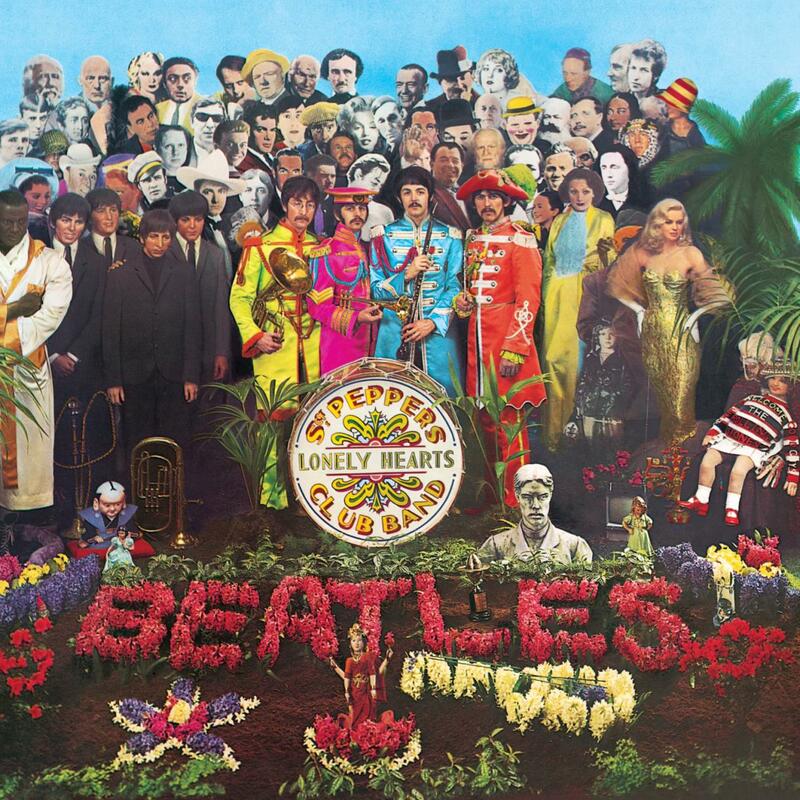 The opening line of the song, “I am he as you are he as you are me and we are all together” suggests that all of the Beatles were involved in the conspiracy. In the “Paul is dead” mythology, the walrus is an image of death. This has been repeated so often in “Paul is dead” sources that it is taken as given, but what is the origin of this? Perhaps it started with Fred LaBour’s article in The Michigan Daily or perhaps because the walrus costume on the cover of Magical Mystery Tour is the only one that is black. Yet, a number of sources have tried to identify the cultural origins of the walrus as image of death. The Book of Rock Lists chose the path of least resistance and stated simply that “In some societies, the walrus is an image of death”. And John Neary, who wrote the Life article, was just as vague when he stated that the “black walrus [is] a folk symbol of death”. B.J. Phillips of the Washington Post, however, took a stab at ascribing the cultural origins of the walrus-as-symbol-of-death when he reported that “According to the hypothesis, the walrus is a symbol of death, although its origins have been attributed to such dissimilar sources as the ancient Greeks and modern Eskimos”. In his tongue-in-cheek piece, Fred LaBour asserted that “Walrus is Greek for corpse”. As Barbara Suczek pointed out, however, the word “walrus” is of Scandinavian origin. Perhaps that’s where the Chicago Sun-Times came up with “The walrus is supposed to be the Viking symbol of death”, but the closest any “Paul is dead” source has come to supporting that claim was when Andru J. Reeve quoted a Michigan student who reported that “a guy in my folklore class told me that when Nordic Vikings started off on a journey to hunt food and encountered a dead walrus on the way, they would turn back. It was bad luck”. None of these seem like compelling reasons for the Beatles to use the image of a walrus if they were perpetrating an elaborate hoax that Paul McCartney was dead. And who was the walrus anyway? All of the Beatles are dressed in animal costumes on the cover of Magical Mystery Tour and it’s not possible to determine who is in each costume from that picture. The Beatles are dressed in the same costumes in the photo on page 5 of the booklet performing the song. Although John sings “I Am the Walrus” and the walrus is seated behind the piano in the group photo, Little Nicola refutes John’s claim that he is the walrus. In the list of song titles in the inside front cover, “I Am the Walrus” is followed by “‘No you’re not!’ said Little Nicola”. Then, of course, is the intriguing line from “Glass Onion” on the White Album: “And here’s another clue for you all/The walrus was Paul”. Perhaps the final word on this subject is on the song “God” on John Lennon/Plastic Ono Band. On that most confessional of songs, John sings “I was the walrus but now I’m John”. In the Journal of Popular Culture, Michael E. Roos provides a more likely explanation for the imagery of “I Am the Walrus”. Roos points to Lewis Carroll’s influence on John Lennon. The walrus is a reference to Carroll’s poem “The Walrus and the Carpenter”, in which the title characters lure unsuspecting oysters to follow them so that they can eat them. John was growing disillusioned with the “Beatle dream” and was acknowledging his role in what he saw as misleading the public. John saw a connection with the Beatles’ relationship with their fans and the walrus and the carpenter taking advantage of the innocence of the oysters. In “Glass Onion”, released in 1968, John made reference to a number of past Beatle songs, and again invoked the image of the walrus with the infamous line “And here’s another clue for you all/The walrus was Paul”. John acknowledged his role as a Beatle, but was now accusing Paul of perpetuating the belief in the “Beatle dream” even though he knew it was false. That is, Paul was the con man. Edgar: I know thee well: a serviceable villain; As duteous to the vices of thy mistress; As badness would desire. Edgar: Sit you down father, rest you..
John included this recording through happenstance, though it does bear some superficial similarities to the circumstances of Paul’s rumored death, not to mention a high concentration of lines making reference to death: “bury my body”, “O, untimely death” and “What, is he dead?”. Paranoia magazine even hears a direct reference to Paul’s death in the radio play, “Paul, you’re darn near death”. Either they are mishearing the line “O, untimely death” or William Shakespeare was in on the hoax as well. The White Album: Well, here’s another clue for you all. The poster that came with the White Album has a number of odd images and of course came under the scrutiny of those looking for “Paul is dead” clues. In the lower right hand corner of the poster (page 7 of the CD booklet) is a picture of Paul dancing. When viewed closely, a pair of ghostly hands are reaching toward Paul from behind. Also, in the lower left hand corner of the poster (page 18 of the CD booklet) is a picture of Paul in disguise. Conspiracy theorists suggested that this image was actually of William Campbell prior to the plastic surgery that allowed him to replace the late Paul McCartney. In the upper left hand corner of the poster is a picture of Paul in a bathtub (this appears on page 3 of the CD booklet). The position of Paul’s head and the suds around him suggest the grisly accident scene of his fatal accident. According to one version of the “Paul is dead” rumor, Paul left the recording studio after arguing with Ringo. In his song “Don’t Pass Me By”, Ringo expresses his regret at the tragic turn of events after Paul’s angry departure from the studio: “I listen for your footsteps coming up the drive/I listen for your footsteps but they don’t arrive”. George moans “Paul, Paul” at the end of “While My Guitar Gently Weeps” and John expresses his anguish over Paul’s death in “I’m So Tired”. At the end of “I’m So Tired” John utters some gibberish which when played backwards sounds like “Paul is a dead man. Miss him, miss him miss him”. The song “Glass Onion” makes a number of references to Beatle songs and events. John mentions “The Fool on the Hill” and states, “I tell you man he living there still”. Perhaps the most intriguing line in the song, however, is “Well here’s another clue for you all/The walrus was Paul”. In the odd conclusion to “Cry Baby Cry”, Paul asks “Can you take me where I came from?/Can you take me back?”. This leads into “Revolution 9”, the track that is perhaps the most analyzed for “Paul is dead” clues. “Revolution 9”: “Turn Me On, Dead Man” … “Revolution 9” is a sound collage, and The Beatles CDography and Steve’s Beatles Page provide transcriptions of the intelligible dialog in the “Revolution 9”. Early in the track two men are heard talking “I know all about it George. I’m sorry. Will you forgive me? Yes”. Supposedly this short recording was John talking with George Martin about the placing of clues on the records. Several parts of “Revolution 9” contain audio clues to Paul’s death–the most noteworthy of these was from the repeated phrase “Number 9”. When this is played backwards, it sounds like “turn me on, dead man”, which darkly recalls the line “I’d love to turn you on” from “A Day in the Life”. In the sound collage of “Revolution 9” are the sounds of Paul’s fatal accident. At one point you hear car horns, then a car crash, followed by a fire burning. When played backwards you can hear “Let me out! There were two. There are none now”. When played normally you can clearly hear the following lines: “he hit a pole. We better get him to see a surgeon. So anyhow he went to a dentist instead. The gave him a pair of teeth that weren’t any good at all. So my wings are broken and so is my hair. I’m not in the mood for words. Find the night watchman. A fine natural imbalance. He must have got it in the shoulder blades. Take this brother, may it serve you well”. The final line marking Paul’s passing of the torch to William Campbell. Abbey Road: The Funeral Procession … The cover photo of Abbey Road is perhaps the start of the “Paul is dead” rumor, as it is said to be a funeral procession. Leading the procession is John wearing white, symbolizing the clergy. Ringo, dressed in black, is the undertaker. Paul, the corpse, is out of step with the other Beatles, he is barefoot and his eyes are closed. George, dressed in work clothes, is the gravedigger. Also, Paul is smoking a cigarette, also known as a “coffin nail”. He is holding the cigarette in his right hand, even though the real Paul McCartney was left handed. Behind the Beatles on the left side of the street is a Volkswagen Beetle with a license plate reading “28IF”, suggesting the Paul would have been 28 if he were still alive. Actually Paul would have been 27 when Abbey Road was released. For those who thought that this was just too tantalizing to let pass, Paul Is Dead: The Great Hoax explained, “To the believer, 28 IF does symbolically state Paul’s age—since people (especially in the Near East where Paul learned mysticism) believe we are all one year old at birth (counting the nine months of pregnancy). True, in this light, Paul would have been 28 IF he had lived!”. The first three letters on the license place, “LMW,” has been interpreted as “Linda McCartney Weeps”. One problem with this interpretation, however, is that Paul had yet to meet Linda Eastman in 1966. The back cover has some interesting features. To the left of the tiles spelling out “Beatles” are eight dots, which when connected form the numeral “3”, so the back cover actually reads “3 Beatles”. Also, there is a crack in the “S” at the end of “Beatles”. To the right of the tiles is a very odd shadow that looks like a skull. The last album the Beatles released was Let It Be. This album was actually recorded before Abbey Road but because the project had been so difficult for the group, no one wanted to face the task of preparing the recordings for release. The original idea for the album had been for the group to “Get Back” to basics. The songs were to have been stripped down to their essential elements without the elaborate production of earlier albums such as Sgt. Pepper. When Phil Spector was brought in to produce the album, however, he added lush orchestration to some of the songs, particularly “The Long and Winding Road” (that led to Paul’s decapitation!). Despite the elaborate production of the music, the album cover featured a simple design. As such, it contained only a couple of “Paul is dead” clues. Against a black background each of the Beatles is shown in a separate photo and, of course, Paul’s is different from his bandmates. Paul’s picture has a red background (blood, of course), while the rest of the Beatles are shown with white backgrounds. Also, Paul is shown facing forward rather than in three-quarter profile. But that’s about it for Let It Be—it’s not really a big source of clues. In the years that followed the Beatles themselves made occasional references to the “Paul is dead” rumor. On his solo album Imagine, John included “How Do You Sleep?”, a mean spirited song attacking Paul. Among other put-downs, John exclaimed, “Those freaks was right when they said you was dead”. Paul later answered “How Do You Sleep?” in “Silly Love Songs” when he sang, “You think that people would have had enough of silly love songs/But I look around me and I see it isn’t so/Some people want to fill the world with silly love songs/And what’s wrong with that? I’d like to know”. So Paul had the last word on that little public exchange. And Paul had the last word on the rumors of his death. The cover of McCartney’s album Paul Is Live shows him with his dog on the famous Abbey Road crosswalk—hardly a funeral procession. In the background of the album cover photo is a Volkswagen Beetle with the license plate reading “51 IS”. Rather than being dead in his twenties, Paul was still alive and making music.